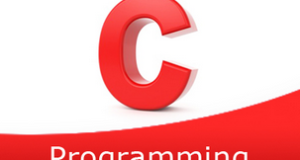 C program to sort the array elements in ascending order – In this article, we will detail in on the aggregation of ways to sort the array elements in ascending order in C programming. As we all know, an array is a sequence of a bunch of elements in any given order whatsoever. Arrays are used to display information in that specific order only. As you can see in the image uploaded, the size of the array is entered first up. The size of the array given in this case is 5. Eventually, the elements in the array are listed. The elements in this particular array are 1, 0, -5, 25, -10. Hence, the descending order of the elements entered is -10, -5, 0, 1, 25. Read the size of the array and store the value into the variable n.
2) Read the entered elements one by one and store the elements in the array a using scanf(“%d’&a[i]) and the for loop for(i=0;i<n;i++). a) Compare a[j] element with adjacent element a[j+1] and find the highest element then exchange the both elements positions using for loop for (j=0;j<n-i-1;j++). 4) After all iterations of for loop, we will get sorted array in which the elements are in ascending order. Print the array elements using the for loop and printf statement. 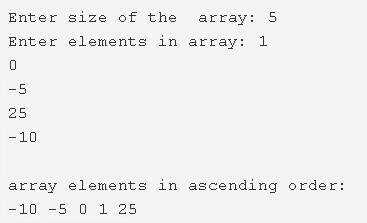 The main() calls the sort() to sort the array elements in ascending order by passing array a, array size as arguments. 2) The sort() function compare the a[j] and a[j+1] with the condition a[j]>a[j+1],if a[j] is the highest value than a[j+1] then swap the both elements. find the highest element by comparing a[j] and a[j+1] and swap both elements. Repeat until all iterations of j. 4) After all iterations of i, the sorted array will be generated in which the elements are in ascending order. 5) To print the sorted array, the main() function calls the print() function by passing the array, size of the array as arguments.